OMG - TOO funny. I would never have thought that either! The first time my 9YO son saw an opossum he thought it was a rat! We lived in southern California at the time in a normal street-filled, house-filled subdivision. One night while we were watching TV in the family room, he announced to us 'we have rats. BIG rats." DH and I looked at each other and back at him. What do you mean we have rats? I've seen them in the backyard. Where in the backyard? In the garden (we had a 20x6 foot plot) and by the back sliding glass door. Oh really...next time you see one let us know. Honest-to-Charlie, not 10 minutes goes by and my 9YO son is whispering to us, "There's one out there now." You would have bust a gut laughing as you watched my DH leap off the sofa, slam open the sliding glass door, and sees...yes, you guessed it, an opossum. This particular specimen was about the size of a 10 lb housecat and was in fact eating the dry catfood by the back door. It sees my heavy breathing, bulging eyed DH and scrams for parts unknown. Harrumphing with satisfaction, DH gently closes the sliding glass door and states to one and all 'that will be the last time HE comes to call." Oh, about 20 minutes later we hear the scrabble scrabble scrabble of dry catfood. 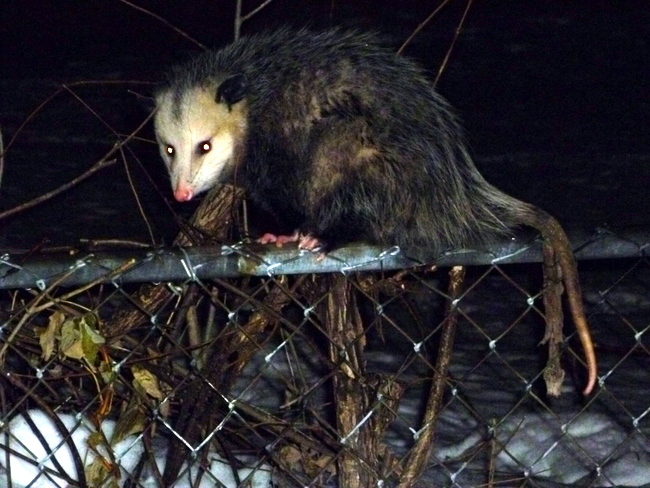 My now thoroughly vexed DH again leaps, slams open, and sees TWO opossums. The little one had brought his big brother. The little one ran off again but the bigger one was on the pass-thru ledge from our kitchen window to the patio area. He saw DH and ran way to the edge and I guess didn't want to jump, so he ran back toward my DH (what was that critter thinking?) upon which time my DH grabbed the tail of the bigger one (what was DH thinking???). Now my 9YO son and I are the bulging eyed persons looking wide-eyed at each other, then at DH, and then at the opossum as it quickly wrapped the dangling length of its tail around my DH's forearm and begins to curve toward the arm (baring its HUGE teeth and hooking its ENORMOUS claws toward his arm). Imagine the cacophony as we're shrieking at DH "are you supposed to do that? ", while the opossum is growling at DH, and DH is saying to us 'it's a little late now''. DH shook his arm upon which the opposum was dangling, and that opossum immediately hung down and actually played dead and unwrapped its tail from DH's forearm. DH casually walked over to the garden and gently let go off the opossum who immediately ran off into the darkness. This story is a well-loved, often told episode at family gatherings. And remember, we lived in southern California...where did those opossums live while not eating our catfood? What a great family story - you have a very "brave" hubby!